Many of my current friends refer to this as my old MG in the garage. Her name is actually "Little Brit"... not sure how she got that name... I presume someone referred to her as the little British car... and I guess it just stuck. It is actually the reason my dog was named Brittany as well. The car was found by me... on the roadside in Rome NY. I was driving the Matador at the time... and wanted something a bit more of a babe magnet for my Senior year. So I mentioned it to my dad to try and hit him up for some cash. ( an actually quite common event ) He of course said no which always led to the preverbal arguments about why not. The next stage caught me by surprise however. He bought the car with the intention of restoring it, but for himself and not for me. His excuse at the time was... I could never afford to restore it myself. He was a smarter man then I gave him credit for at the time. It was later revealed however that he was infected by the Triumph disease as a youngster in Holland by means of a Triumph Vitese restoration. So he began to restore the car by himself in the garage, mainly due to I was infuriated with him for buying MY car which I found and I wanted to restore. After a couple weeks of not setting foot into the garage... I started to peek in to see what he was doing. After seeing how poor his craftsmanship was I started to redo things he had already set aside as done. He began to get upset with me, yet realized I was doing a better job then he was. He ended up retiring to his Lazyboy while I finished the car. This worked out well because he was put in charge of flipping through catalogs and buying the remainder of the parts that we needed to finish the car. A role I could obviously not financially manage. 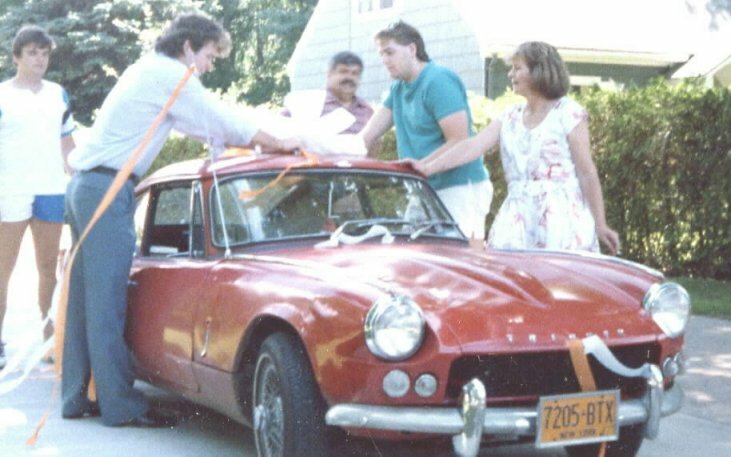 It ended up that the car was given to me as my graduation present. Which at the time I thought was cool... but in hindsight... I wonder if I had just become too hard a person to shop for. I have many pictures of `lil Brit and will scan them soon.